On clear nights, the cloudy band of the Milky Way spans the night sky, photographed here from Cadillac Mountain during the Acadia Acadia Night Sky Festival on Sept. 15, 2012. If you need a good excuse to stay up late this week, stargazing could be at the top of your list, as a meteor shower promises to light up the sky with as many as 120 meteors per hour the night of Wednesday, Aug. 12, and the morning of Thursday, Aug. 13. The Perseids are an annual summer phenomenon caused by the Earth passing through the dust particles of the comet Swift-Tuttle. They are named after the constellation Perseus: the 24th largest constellation in the sky, located in the Northern hemisphere. So where should you go to view a meteor shower in Maine? The most important thing to keep in mind is light pollution. The best place to see them is in the country, far away from city lights, which will block your view. Fortunately, because Aug. 12 and 13 mark a near new moon — where only 5 percent of the moon will be visible — moonlight will not obstruct your viewing, which means the only light you’ll have to worry about will be synthetic. For Mainers, meteor-tracking website spacedex.com recommends the night of Aug. 12 into the morning of Aug. 13 for maximum visibility, with the best hours for veiwing falling between 11 p.m. and 4:30 a.m. This is when the peak of the meteor shower will occur. to look to the North/East if there’s difficulty in finding the Perseus constellation. It’s right next to Cassiopeia (the constellation that looks like a “W”). The American Meteor Society also recommends bringing a lawn chair to avoid straining your neck, a blanket, warm clothes if it’s a brisk night, and something to drink. There’s no need to bring a telescope or binoculars, since both restrict your field of view. For those who want to take pictures, 5-second-to-15-second exposures are best, since the stars are moving in the sky. 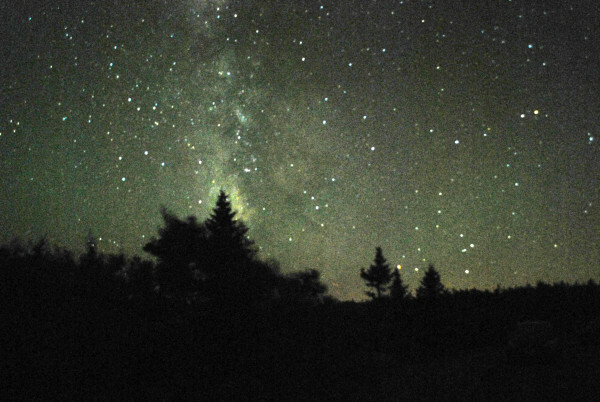 Remember, light pollution is not your friend when it comes to viewing any celestial display. The American Meteor Association proposes visiting secluded areas such as a beach or a park for the best experience. A previous version of this post incorrectly stated that the debris travels at 132,000 miles per second. It has since been corrected to 37 miles per second as according to NASA.